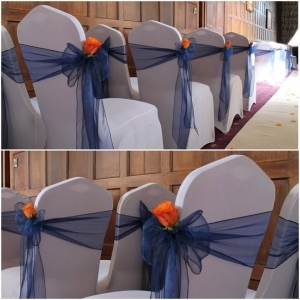 Our Luxury chair covers fit most chairs and are available in Lycra and Polyester. Choose from White, Ivory and Black alongside your chosen colour. Sashes are available in all colours in Organze, Satin and Lace. When it comes to planning your wedding there are many things to do, and your wedding flowers are sure one of the most important aspects of your big day. Finding the right florist to work with you is essential to making your day a success. 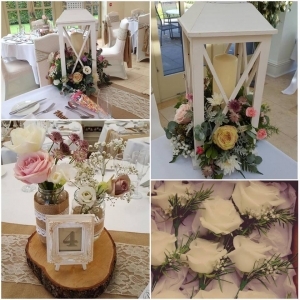 Beautiful wedding flowers can pull your whole wedding together, we can provide your wedding flowers to enhance your venue and complement other aspects of your day. Flowers include Bridal Bouquets, Bridesmaid flowers, Table Centerpieces, Corsages, Buttonholes, Venue and Church flowers. 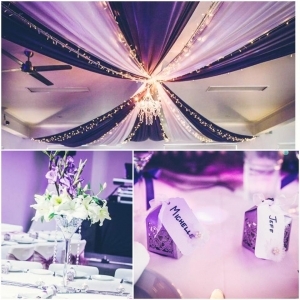 Brighten your venue with our amazing Starlight Set, consisting of the Starlight Backdrop, Starlight Top Table Skirt and Starlight Cake Table Skirt. 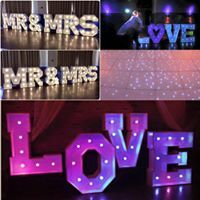 The love sign is perfect for any wedding, the letters are 4ft and can come in various colour lights and we also have the special heart too. 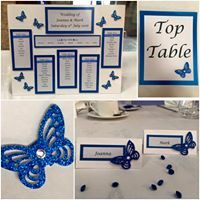 Allow us to create your table plan, name place cards and table numbers. We can also design invites and save the date cards. We provide a wide range of centre pieces including, Fish bowls, Lily vases, Martini vases, Bird cages, Candelabras, Manzinita trees, Flowers, Ostrich feathers and much more. 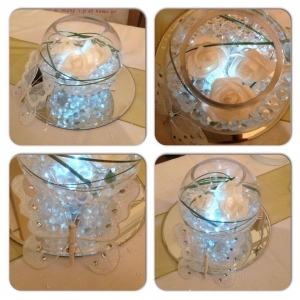 We can provide optional extras such as mirror plates, scatter diamonds and tea lights candles for that extra wow factor. Transform your room with Drapes, Swags and Runners. Allow us to create the perfect set up using the colours to match your scheme hiding any unwanted walls and features. Choose from a variety of styles and colours. 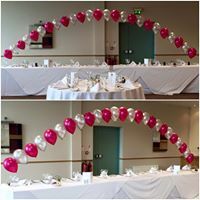 We do clusters, arches, air walkers and the popular double bubbles. Your wedding day is the biggest day of your life. All eyes are on the bride and we believes it is important that not only you do look fabulous but you feel fabulous too, throughout the whole day. 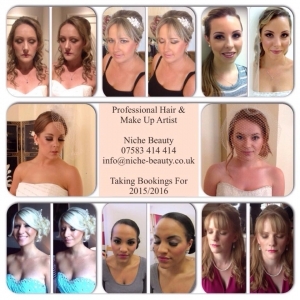 As a fully qualified make-up artist Nisha specialises in bridal, fashion, catwalk and party make-up and strives to achieve perfection in every look she creates. Wedding Décor has always been our passion so we were excited to launch our new Asian Wedding Range. 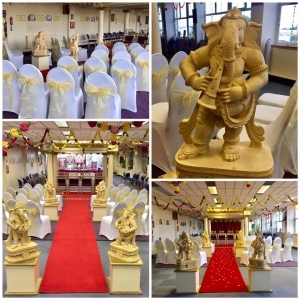 We are now offering decor hire for sangeet nights, mendhi nights, engagements and weddings, alongside chair covers, walkways, mandaps, centerpieces and fresh flowers. 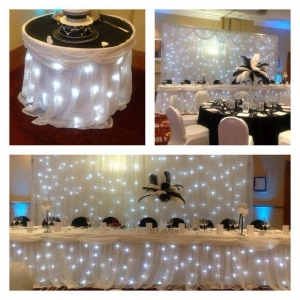 As big fans of a little sparkle we’re thrilled to be able to offer a complete Sequins hire range including; Sequin Tablecloths & Runners, Table Linen, Tablecloths, Covers, Overlays, Runners & Napkins. We currently stock the following colours; Rose gold, Champagne, Gold and Silver. 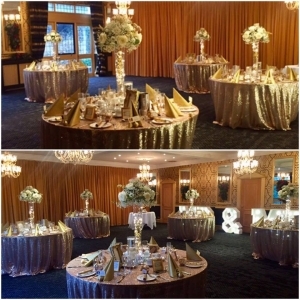 Why not add sparkle to your function or event? 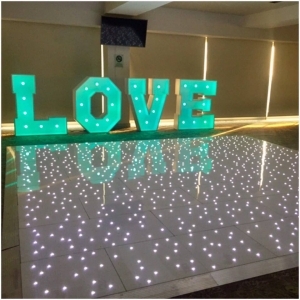 Whether it be a Wedding, Birthday Celebration, Anniversary or Christmas Party our white LED dancefloors will give the WOW factor to every occasion. Our Candy Cart and Candy Buffet can keep your guests entertained for hours. Not only will we match this to your wedding theme but we will provide you with a list of sweets to choose from. 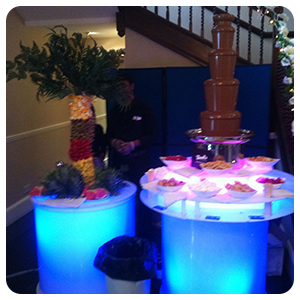 A Chocolate fountain makes an elegant and unique addition to any party event. A great sweet treat for adults and children. Providing personalised chocolates we have a range of favours available for you to choose from. 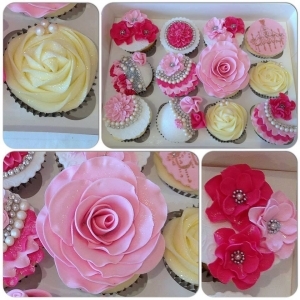 Or treat your guests to some personalised cupcakes wowing their taste buds. 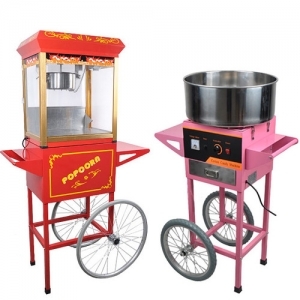 Candy Floss Cart and Popcorn machine. 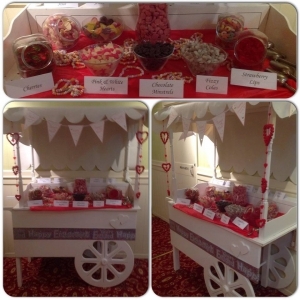 Our Candy floss cart and vintage popcorn machine are regularly booked for Birthdays, Weddings, Engagements, Anniversary’s, Bar Mitzvahs, Promotional event days… they are perfect to be enjoyed by any age group.